This Soft Pencil Digi stamp is one of the first digi stamps I won. It's actually all one stamp, but for this apperture card I cut it apart. My kraft and red paper is redder in person, but turned kind of a grape color in the photo, it's the lighting thing again. Supplies: Ivory 4 1/4" square card with apperture-JoAnn's Essentials, Papers: The Paper Studio, Stampin Up-Very Vanilla, Kraft and Burgandy paper unknown, Soft Pencil Digi Stamp, Stamps by Judith-sm. dots, Ink: Stampin Up-Ruby Red, Color Box-Silver, Copic Markers, Sakura Gelly Roll pen-clear star, Coluzzle shape cutting template-Square, ribbon-Offray, pop dots. It's a great take on our challenge and I love the Kraft and Red together! this is just darling! i love your design! thanks for joining us at the Pixie Cottage this week! Too cute - your work is so great! Please check over at my blog as I've posted up a little award for you. Great aperture card!You really did well adding the sketch and the theme in one card. Fabulous! Thank you for playing with The Pixie Cottage this week. Is this too cute or what? Great card!! What a great way to use kraft, this is a really cute number! I love all those hearts for a background pattern. 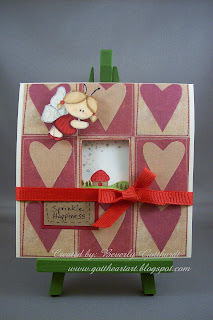 Thanks so much for joining us in this week's CAS-tastic Wednesday "Krafty Kreations" Clean and Simple card challenge!